An editorial in the current edition of the North Carolina Baptist Biblical Recorder, written prior to the Confederate defeats in the Chattanooga Campaign and at Knoxville, strives to lift the spirits of white Baptists of the South. Despite the losses in Tennessee, faithful believers in the Confederate cause yet want to cling to the belief that their nation’s army is ultimately invincible. Uplifting, if conflicted, commentaries such as this offer ultimate hope in the face of adversity and despair. Within a short time there has been a very pleasant change in the spiritual condition of the churches in North Carolina–For a long time after the commencement of the war they seemed to be declining, or at best to be only stationary. The absence of so many of their efficient members in the army, or the excitement and alarm, incident to a state of war, served as a barrier to their progress. During the present year, however, they have been aroused from the lethargy which had crept over them, and have resumed their usual, aggressive character, as the letters which we have been publishing from week to week conclusively show. 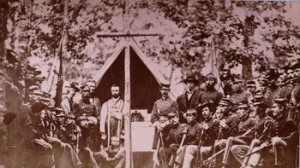 We doubt whether revival influences have ever been more extensive among the churches in N. Carolina than during the year now closing; and we believe that they are not confined to our own denomination or State, but have prevailed in some degree in almost every portion of our country, and in every division of the army. We have watched the progress of this gracious work with real, heart felt pleasure. We had seen, with sorrow, the gradual decay of vital religion and the rapid growth of wickedness during the earliest stages of the war, and, in common with many others, had begun to look with anxiety to the results of these things. It is in the highest degree cheering to turn from them and contemplate the advancement of the Redeemer’s kingdom under circumstances so unfavorable. But these manifestations of the presence of God’s Spirit among our people have afforded us pleasure on other accounts. To us they give the surest pledge of success in this bloody and calamitous struggle. With God on our side we can not be conquered, no matter what may be the numbers or power of our enemies. Without His aid we shall not succeed, no matter what be the skill of our generals or the valor of our soldiers; and these outpourings of His Spirit on our army and on the people at home, while infidelity and the most unblushing corruption are rife among our enemies, are indications unmistakable that God is for us and that He will in his own time and way give us what we have all so earnestly desired and so long and fervently prayed for. With such manifestations as these, we shall not despond, though our armies should not be as successful as we could wish, or even though they should be defeated and our situation viewed from a purely human standpoint become much more discouraging than it has ever been. We are also rejoiced to see the revival influences spreading among the churches and in the army because they tend to create and strengthen that moral sense which is necessary to carry us through the trials and discouragements and sorrows of this fearful struggle. With a firm and unwavering trust in God, men can not be discouraged by defeat, as they would be if they look not beyond themselves and their own resources.–Faith gives them courage in the hour of conflict, patience and resignation under disasters, and contentment under hardships and privations. To the moral sense of the community we must also look for the suppression of extortion and speculation, now so rife throughout the land. Laws must be enacted forbidding such practices, but they will be powerless, as laws always are, unless they receive the cordial approbation and support of the people. It will be vain therefore to expect that extortion will cease while the love of money, the very root and source of the evil, is supreme in so many hearts. It must be driven out by a higher and holier love before its fruits can cease. So, according to the editorial, with God on the side of the white Confederacy, the South cannot be defeated. Yet if the Confederate Army is defeated white Baptists should not be despondent, for God will bring victory in his own “time” and “way” … even though losing the war would reveal that God had not been on the side of the Confederacy. Perhaps the inherently contradictory nature of the argument is a sign of the mounting confusion that is arising within the minds of white Southern Christians who were once certain that God’s Confederate nation was invincible, but who are now increasingly recognizing that victory over the North may not be possible. How to reconcile that which is irreconcilable in any ordinary manner? Increasingly, the answer to this question is a refocusing on the supremacy of the spiritual over the temporal. By re-framing victory in heavenly terms rather than earthly, one can reasonably argue the white South’s God is winning, rather than losing, and in fact can never be defeated. The revivals of the past year are the key to real victory. The white South can win through defeat. Greed is the reason for earthly defeats, spiritual conversions the count of true victory. Unacknowledged is the naivety of the greed narrative. The very basis of the Southern economy since the 1820s–African slavery–has been greed. The economic tale of the antebellum South has been that enslaved labor produces greater commercial profits than wage labor. The war, which the Confederacy is now losing, has been fought over the stated preservation of African slavery in order that wealthy Southerners might continue to reap enormous profits off the backs of enslaved workers. On the cusp of the war, the ten richest counties in America had all been in the South, with all ten consisting of large proportions of large plantations worked by thousands of enslaved Africans. Thus, as the editorialist acknowledges, greed is indeed dragging down the Confederacy. What he cannot say, what he dares not say even if he wished, is that the elimination of “the love of money” within the Confederacy would by necessity entail the abandonment of African slavery, and thus destroy the very nation that the Confederate Army is so valiantly striving to preserve.